Barley has had 2 wiggly teeth bothering him for about 2 weeks now. Just wiggly enough to make biting down on something unpleasant, but not wiggly enough to come out...yet. One of them finally came out last night, and DH instructed Barley to put it inside a plastic baggie before it went under his pillow. I thought DH was worried about blood spots, but he shrugged, and whispered, it is really hard to find a tiny tooth under the pillow of a sleeping child without waking him. Well, the Tooth Fairy has managed just this for generations, but, whatever. DH and I were completely perplexed, and throwing each other querying looks, but neither daring to say anything. 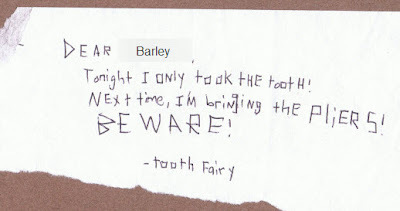 Barley was not fooled for a minute, though, and he accused his brother of writing it. After a minute, Teddy confessed, having been inspired by his recent Far Side mania. We all had a good laugh over it. Then DH warned Teddy that he had better watch out. Since Barley lost his other tooth tonight, the Tooth Fairy was coming back, and she might not take kindly to being impersonated! Funny, Teddy didn't really seem very worried. Haha! What a cute note!